Take your mass and size goals to the next level by using Progain Extreme. Progain Extreme provides 40g of protein in every serving using fast acting and slow release proteins. Every serving of Progain Extreme provides 600 calories, 3g calcium HMB and 40g of high-quality protein for gains in muscle size. It also naturally contains 9.9g of BCAAs and 7.9g of glutamine per serving. If you are making an attempt to achieve your peak size, Progain Extreme contains the extra nutrition that will help get you there effectively. Serving -1 and half Scoops. Training days; 1 Serving after training. Another mid-morning or mid-afternoon. Maltodextrin, whey protein concentrate (milk), milk protein concentrate, isolated soya protein (contains emulsifier: soya lecithin), cocoa powder (6%), oat flour (5%), soya oil powder, medium chain triglycerides, calcium hydroxy methylbutyrate, fructooligoosaccharide (1%), flavourings, thickener (cellulose gum), sodium chloride, sweeteners (sucralose, acesulfame K). 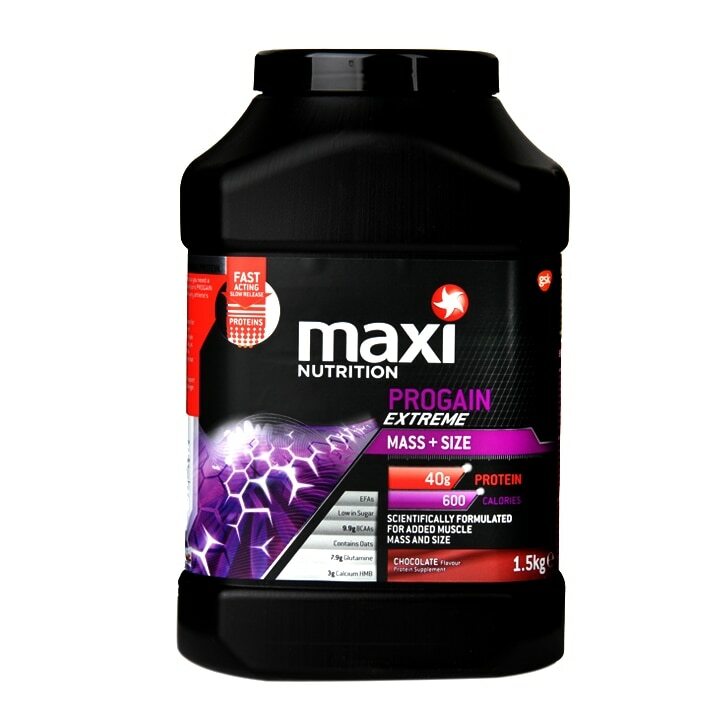 MaxiNutrition Progain Extreme Powder Chocolate is rated 4.7 out of 5 by 7. Rated 4 out of 5 by wineman88 from Top flavour Great when mixed with vanilla whey protein powder and peanut butter. Rated 4 out of 5 by Dippy88 from Tasty and good energy, but expensive The product has a great taste with water, mixes well in a cocktail shaker. A little bitty but I like that. I’ve felt 2 scoops sustain my energy levels for a good few hours. The suggested serving of 150g is a lot though, so only 10 servings per tub. Rated 5 out of 5 by Hodge from Great tasting, mixes well, and shows results! Brought this a couple of weeks ago and is already showing results. Rated 5 out of 5 by Ultra 88 from Taste good mixed easily Excellent product put 5lbs on in just over a week. Rated 5 out of 5 by Dda1 from Great stuff Does the job well. Mixes tremendously with milk. Had a few iffy experiences with other products but this has been great. Rated 5 out of 5 by Michael65 from maximuscle This is an excellent product to use for gaining muscle. Rated 5 out of 5 by Yoloswag69 from Good stuff Ordered online, got it in good time. Does the job in aiding with your diet if you're trying to bulk.